ONLY 50 years ago, cancer was the Demon of Death spoken of in hushed whispers. What appeared to be a perfectly normal cell suddenly turned into a stealthy, lethal killer, rampaging through the body and destroying its victim from within. Even as recently as the '70s, many theories and myths abounded about cancer. It was, in the words of Bert Vogelstein of Johns Hopkins University, still an unopened "black box". But Pandora's box is now creaking open. Says Vogelstein, "In the past 10 years - and especially in the past 5 - there has been a revolution in cancer research." Scientists have a new and expanded understanding of this tiniest of all assassins. A better reckoning of genetics and molecular biology have enabled today's scientists to unlock the secret mechanisms that transform the body's cells into kamikaze maniacs. Thousands of these scientists, working overtime in molecular biology and genetics laboratories throughout the world, have established a clear link between genes and the chances of getting cancer. They believe that normal cells suddenly go amok because their genes - directed by mutations precipitated by several factors - send wrong messages that order uncontrolled cell propagation. In essence, says Vogelstein, cancer is a genetic disease. And this revelation, contrary to popular belief that says that what is in your genes is pre-ordained and inalterable, brings hope of dramatically improved cancer treatments. Cell shock At the root of all cancers is the cell. When a cell divides, its DNA is copied and genetic information passed on to each of the 2 new cells (see diagram: Cancer edition). Cell growth is controlled by 2 genes: oncogenes, or growth accelerators, and tumour suppressor genes, or brakes. However, the process is imperfect: copying errors frequently alter or mutate the genes. Scientists now realise that an accumulation of such mutations in both oncogenes and tumour suppressor genes cause normal cells to replicate madly: cancer begins when a cell's accelerators and brakes are "dismantled". Says Curtis Harris, who directs cancer gene research at the National Cancer Institute near Washington, "For the first time, we can look at a tumour and begin to understand what's going on." Defective genes are also inherited by children. Mary-Claire King, a California geneticist, discovered that a certain breast cancer gene is passed on from mother to daughter. Scientists have found that at least 10 per cent of breast, ovarian and colonic cancers are, in fact, inherited (see chart: Malignant squad). Further, external agents - carcinogens like benzene, pesticides, asbestos and tobacco, and ultraviolet light and nuclear radiation - modify the vital growth-control genes. There is increasing evidence that viruses, including the dreaded Ains-causing human immuno-deficiency virus (HIV), play a role in causing cancer. The monitor One lucky find was the P53 gene. Although it was discovered in 1979, scientists took 10 years to realise that what they thought was an oncogene was actually a cell growth suppressor. p53 watches over cell division. When damaged UNA is being copied, P53 halts cell division and activates genes to repair the UNA before turning on the engine again. If the damage is too severe, P53 instructs other genes to induce the cell to self-destruct. Mutations in ?53 can cause cell division to run haywire. Vogelstein's team and another group lead by Curtis Harris independently identified several mutations in P53, which "appear to be involved, directly or indirectly, in the majority of human malignancies". In almost 50 per cent of all human tumours, P53 was found to be mutated. The masterkey In April this year, Alexander Kamb and his colleagues at Myriad Genetics, Inc, and the University of Utah discovered the "multiple tumour suppressor gene" (MTS! ), the masterkey in the cell division cycle. Mutations in MTS! can cause skin cancer or melanoma, breast, lung and brain cancers. MTS! works by responding to signals like those put out by white blood cells when wounds heal. It controls the secretion of Pl6, a protein that inhibits the action of enzymes that kick off cell division. p!6 was discovered only late in 1993 by David Beach and his colleagues at the Cold Spring Harbor Laboratory on Long Island. In almost half the 290 tumour samples the Utah team studied, MTS! was mutated or missing. The switch A gene uncovered in July this year stood conventional thinking on cancer on its head. Cells turn cancerous not only when they divide uncontrollably, but also when they refuse to die. Every time a cell is instructed to divide, it is 3 simultaneously ordered to kill itself (see box: Programmed for death}. The cell survives only because of growth factor proteins that cancel out the harakiri signals. Gerard Evans and Liz Harrington at London's Imperial Cancer Research Fund discovered a gene, C-MYC, that mutated in most types of tumours. The gene is switched on by the growth factors and the division engine begins to chug. When the level of growth factors falls, the gene switches off. However, if the gene is damaged, it remains switched on and the cells continue dividing. The scientists recently discovered that this gene also primes cells for death. The timer Healthy cells die after several cycles of cell division; they have timing-devices known as telomeres, repetitive sequences of DNA that protect the ends of UNA strands from fraying and cleaving in much the same way as plastic guards on the ends of shoelaces. Telomeres are lost with each cell division, and after about 200 divisions, they are exhausted. The cell stops dividing and, ageing rapidly, dies. In some cells, however, the length of the telomere chains is maintained, making them "immortal". Literally. In April 1994, Calvin Harley and his team at Canada's McMaster University isolated an enzyme - telomerase - which exists only in cancer cells. They believe that telomerase blocks the break-up of the telomere chains. If scientists make a drug that blocks the production of this enzyme, they could slow the growth of cancer cells. Scientists are also trying to track the complex chain of events associated with the spread of tumours to other parts of the body. After forming, a tumour can remain reasonably harmless indefinitely. But suddenly, a dangerous transition occurs and some cells, instructed by as yet unidentified genes, secrete chemicals that attract blood vessel cells. These cells form capillaries that grow into the tumour and nourish it. Normally, such pirate blood vessels are kept at bay by a chemical called thrombospondin and are encouraged to grow only when a wound needs to be healed. Recently, Noel Bouck of the Northwestern University Medical School announced that the production of thrombospondin is regulated by the P53 gene. 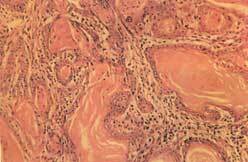 These blood vessels also carry the cancerous cells to other parts. This diasporic spread, known as metastasis, is an extremely complex process orchestrated by several genes. Some genes facilitate the outward movement of cells; others enable these brigand cells to dissolve surrounding tissue. In 1988, Patricia Steeg of the National Cancer Institute discovered a gene called NM23, which she believes helps mature cells arrange their clothes and stop dividing. Her research indicates this gene is faulty in cancer cells. With better understanding, there has been some success in treating cancers like Hodgkin's lymphoma, childhood leukaemia and germ cell tumours. Unfortunately, similar successes in more common cancers - lung, breast and colon - have just not materialised, says Karol Sikora, professor of clinical oncology at London's Hammersmith Hospital. Scientists have questioned the whole approach to cancer therapy, in which patients are exposed to a regimen of chemotherapy and radiotherapy and horrific side-effects. Poison to destroy poison. Although some diehards still believe " that a wider dissemination of promising i results from clinical trials wilf lead to the use g of higher doses of chemotherapeutic drugs in combination with radiotherapy and aggressive surgery at an earlier stage, others propose that the focus should shift to controlling cancer cells rather than eliminating them. Some researchers talk not of bombing out cancer cells, but tricking them into dying naturally. Others hope to rein in the cancer and rehabilitate the cells, an approach similar to that used to control diabetes and hypertension. For instance, the discovery of telomerase, which makes a cell divide endlessly, has opened up a new approach to knocking out cancer. Harley, who made the discovery, is now on leave to Geron Corporation, a biotechnology firm in California that hopes to produce an agent that blocks telomerase. The MTSl gene, say scientists, codes for a protein that could be fashioned into a drug that stops tumour cell growth. Other scientists are working at starving tumours of blood and nutrients. Clinical trials are being run on several drugs and scientists hope that even if they cannot cure the disease, they can at least arrest its development. Recently, Aaron Yeung and his colleagues at the University of Southern California School of Pharmacy in Los Angeles discovered a new protein - cytostatin - that may be able to prevent the maniacal growth of blood vessels into tumours. Isolated from a strain of human leukaemia cells, the team found that this protein was able to block blood-vessel growth in chicken embryos and rabbit corneas. Tying their feet Other scientists are targeting the growth-signalling mechanisms employed by cancer cells. They are developing synthetic analogues to growth factors, which slow the growth of the cancerous cell by competing with the true growth factors for binding sites - regions on the cell surface on which these chemicals attach themselves. Other targets include important signalling enzymes within the cell and other chemicals produced in the cell nucleus that regulate the reading of instructions from the DNA. Gene therapy An approach that is gaining in popularity is "repairing" genes - gene therapy (see box:Manipulating the basics). Sikora, for one, believes that scientists will soon be able to knock out harmful genes. Already, almost 100 gene therapy trials - most of them for cancer gene therapy - have been approved worldwide, particularly in the us. The Recombinant DNA Advisory Committee in Washington has okayed some 50 trials and 7 trials have been given the go-ahead in the UK. Immune boost Some scientists are building on a human's in-built ability to deal with disease - the immune system. Scientists are exploiting defence chemicals, cytokines, which the body produces in response to foreign organisms. Of these, interleukin-2, which is the most lethal and can be produced abundantly using recombinant UNA technology, seems to induce remission in 10 to 20 per cent of patients with kidney cancer and melanoma. However, fames A Russell of the Tom Baker Cancer Centre in Alberta, Canada, warns that these compounds are toxic in large doses. They arc also expensive and labour-intensive. Earlier this year, David Berd and his colleagues at the Thomas Jefferson University in Philadelphia vaccinated 47 patients with melanoma with their own cancer cells that were inactivated by radiation. The researchers found that after 3 years, 60 per cent of the vaccinated patients were cancer-free, whereas only 20 per cent of unvaccinated patients were cancer-free. According to Herd, whose group has just been awarded a patent on this vaccine technique, this works best with patients whose tumours are small enough to be removed, preventing a recurrence of the disease after surgery. Synthetic drugs Meanwhile, other researchers continue to screen a wide range of synthetic and natural chemicals in the hope of finding effective drugs with limited side-effects. J Carmichael, a professor at the CRC Academic Unit of Clinical Oncology at the UK'S Nottingham City Hospital, predicts that in the next 10 years, the approach to developing new chemotherapeutic agents is likely to change from an emphasis on broad-based screening, essentially a hit-and-miss process, to a drug design based on a sound understanding of what goes on in cancer cells. However, the 4-decade-old empirical approach has yielded some success. Taxol - a compound extracted from the bark of the Pacific yew tree over 20 years ago - was approved last year in the us as an effective drug for ovarian cancer; approval for its use to combat breast cancer may come any time. Because it is available only in extremely small quantities, scientists are looking for alternative sources. Earlier this year, teams from the Scripps Research Institute in California and Florida State University reported that they had successfully synthesised the drug. Another product, bryostatin, derived from marine organisms, has shown anti-cancer effects. Scientists believe that it blocks the transmission of certain signals within cancer cells. Its effects are being evaluated clinically in Britain. Scientists are now trying to design drug molecules rationally, so that they home in on specific targets like enzymes involved in cell proliferation. Using this approach to switch off certain cell activities, scientists are testing several drugs like flourouracil, aminopterin and methotrexate. Although still a deadly killer that claims more than half a million lives in the US alone, scientists are upbeat about taming the scourge of the century. And they believe that behind this hope is the greater understanding of the disease that they have gained. As Sikora says, "We are now leaving an era of empiricism and entering an age where our knowledge of genetics and logical molecular design is likely to radically change the futureface of cancer treatment. Today's dreams are likely to become tomorrow's reality."